1950s: teenage boy looks down, glances up at trees, shoves hands in pockets, walks across dirt path in field and kicks stone. hd00:19UNITED STATES 1940s: Kids playing at table / Close up, hand arranges, counts blocks. hd00:251940s: Boy talks to man and woman at desk. Woman responds to boy. Boy speaks and leaves office. 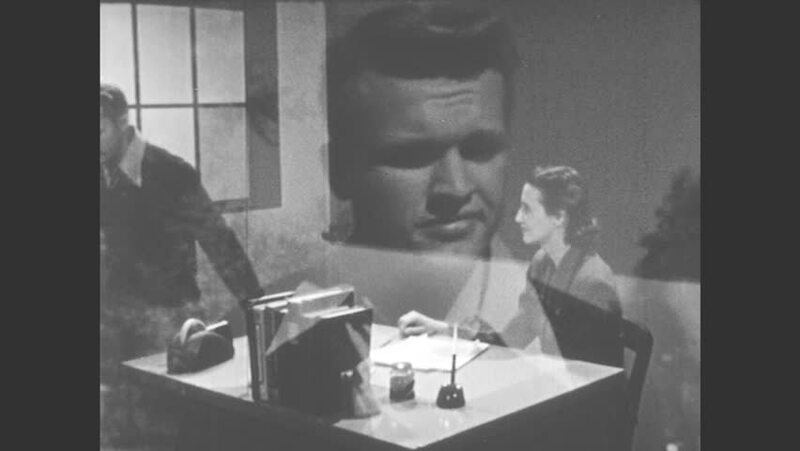 Man and woman talk at desk. hd00:20POLAND 1950s: Men playing folk music on instruments. Children dancing to folk songs. People dancing to music in field. hd01:24CIRCA - 1943 - Army engineers test out tank road blocks and driving on challenging roads. hd00:22UNITED STATES: 1940s: man looks at coin and thinks. American cent. Boy speaks to class. hd01:20CIRCA 1950s - Paratroopers parachute out of a Fairchild C-119 Flying Boxcar transport aircraft and scout planes are used for aerial reconnaissance. hd00:151940s: Old woman hands Booker six eggs.